In his influential book “The Fractal Geometry of Nature” (1982) Benoit Mandelbrot (1924 -2010) argued that “clouds are not spheres, mountains are not cones, coastlines are not circles and bark is not smooth” pointing out the fact that real objects are quite unlike pure, Euclidean geometrical objects. Geometry appears cold and dry, he notes, because of “its inability to describe the shape of a cloud, a mountain, a coastline, a tree”. Inspired by non – linear Mathematics, Mandelbrot introduced a new kind of Geometry, studying what Euclid leaves aside as formless and attempting to investigate what in “The Fractal Geometry of Nature” is described as “the morphology of the amorphous”, a Greek oxymoron translated as “the form of the formless”. To describe the objects of interest of this new Geometry, he coined the term “fractal”, an anglicized Latin word describing equally well the rugged, fractured form certain shapes, such as the shape of a cloud, a mountain or a coastline, and their extraordinary property of possessing non – integer (fractional) dimension. It turns out that the nature of the “amorphous” is deeply mathematical and, probably against intuition, may arise from simple, recursive mathematical rules, i.e. rules that may be perpetually repeated using each time their previous result as a new input, in an endless recycling sequence. The first seven iterations towards the construction of Koch’s snowflake. A minimalist example of such a fractal structure is provided by Koch’s snowflake, a shape with finite area and infinite perimeter proposed in 1904 by the Swedish mathematician Helge von Koch (1870 – 1924) to demonstrate the possibility of a nowhere differentiable curve (i.e. a curve possessing no tangents at any point). Starting from an equilateral triangle, the shape is constructed by repeatedly replacing the middle third of every side by an isosceles protrusion with sides equal to the replaced segment. As the iterative construction proceeds, the shape’s outline becomes increasingly rugged and irregular and a basic pattern repeats in ever smaller scales ad infinitum. The limit of this procedure is the snowflake, aptly named after the obvious resemblance to the real snowflakes, displaying the symmetry of a regular hexagon. Any part of Koch’s snowflake contains infinitely many downscaled copies of itself, a fractal defining feature called “self similarity”. Unlike ordinary geometric objects of Euclidean Geometry, the Koch’s snowflake possesses non integer dimension. The dimension of a shape can be defined as the exponent d of the number n^d which expresses the number of downscaled copies of the shape necessary to cover itself, where 1/n is the scale ratio. For example, a square can be covered by n^2 downscaled by a ratio 1/n copies of itself and therefore it has dimension d=2. To understand how any shape may possess non integer dimension, let us concentrate only on one side of the snowflake, the so called “Koch’s curve”: it is evident that four copies of it, downscaled by a ratio 1/3, are necessary to completely cover it. Therefore, if the curve’s dimension is d, the equation 3^d=4 should hold, yielding a dimension d=ln4/ln3, a number approximately equal to 1,2619. This non integer dimension places Koch’s curve in the region somewhere between a one dimensional (such as a line) and a two dimensional (such as a square) geometrical object. Another well known fractal example, Newton’s fractal, is generated by applying a simple recursive method, called Newton’s algorithm, for approximating the complex roots of a polynomial equation. For example, the equation z^3-1=0 has three complex roots (1, -1/2+isqrt(3)/2, -1/2-isqrt(3)/2 where i is the imaginary unit) and Newton’s algorithm may generate sequences z1, z2, z3, … converging to any of them. In order to get the algorithm going, one has to provide it first with an arbitrary selection of a point on the complex plane, corresponding to the initial term z1 of the sequence. Each different initial selection produces a sequence converging to one of the three different roots and may be colored accordingly using one of three colors. Remarkably, the colored regions produced this way, assemble a spectacular image: their boundaries are highly irregular and rugged, consisting of copies of the same basic oval shape in ever smaller scales ad infinitum, displaying evident self – similarity as every small part of the picture seems to be a downscaled copy of a larger part. Normally, such a Newton’s fractal is constructed using three colors (each corresponding to one of the three complex roots) and their various shades to represent how fast the resulting sequence converges to the root. It is pictures such as this that during the last three decades attracted interest from a wider public and made fractal imagery a part of popular culture making star appearances anywhere from book covers to crop circles. Fractals became thus exceedingly detached from their strict mathematical background and acquired an abstract esthetic character on their own right, viewed either as curiosities or simply beautiful (and often quite gaudy) pictures. Left: Kupka’s “Fugue in two colors” (1912), a painting from the “Amorpha” series. Right: A detail of Newton’s fractal. Having been thus been accustomed and trained to fractal imagery, one could easily recognize an eerie resemblance between the Czech painter’s František Kupka (1871 – 1957) abstract paintings, dating from the early 20th century, and some well known and widely used fractal images produced several decades later. Kupka’s “Amorpha” series, painted only a decade after Helge von Koch developed his idea of the snowflake, display a number of features typical to fractal objects. Benoit Mandelbrot himself had observed the fractal nature of Kupka’s work and the very name “Amorpha” is the same word he used 70 years later to describe the objects of his new Geometry. In a 2008 interview to Swiss art curator Hans Ulrich Obrist, Mandelbrot admitted that he became “deeply interested in the paintings of Frantisek Kupka, the first avant – garde Czech painter, because a certain period of his work was clearly “fractal””. 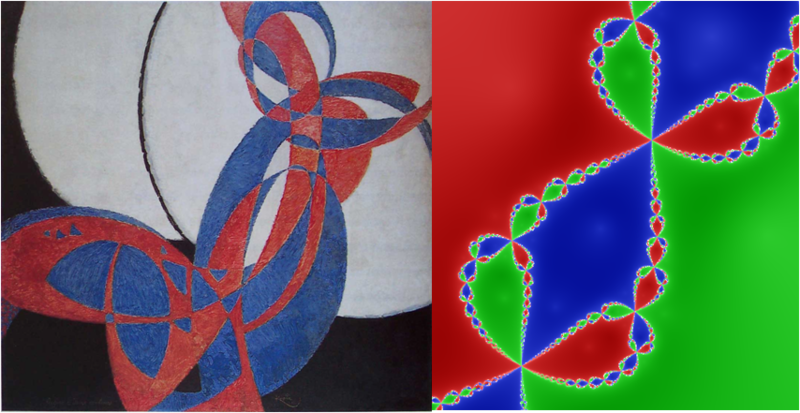 A particularly striking example of what Mandelbrot referred to is provided by Kupka’s “Fugue in two colors” (1912), a picture alluding strongly to the connection between music and Mathematics. Here the artist creates an abstract image with regions of increased complexity by repeatedly intertwining roughly elliptic shapes in various scales. The resulting form seems to hint on self similarity and displays, due to some strange coincidence, unmistaken resemblance to regions of the Newton’s fractal described above. Mathematical influence can easily be traced in Kupka’s biography and it is true that shortly before the creation of the “Amorpha” series, Kupka had attended meetings of the “Puteaux Group” or “Section d’ Or”, a collective of artists assigning great significance to mathematical abstraction as nature’s design. Meetings were organized at the apartment of the cubist painter Jacques Villon and Francis Picabia, Robert Delaunay and Fernand Leger were regular participants. Villon, born Gaston Emile Duchamp (1875 – 1963), played a key role on the group’s choice of exhibiting under the “Section d’Or” (Golden Section) name, obviously alluding to the golden ratio φ, a number approximately equal to 1,618 and associated with esthetic perfection since antiquity. At some point, the mathematician Maurice Princet (1873 – 1975), often mentioned as the “mathematician of cubism” (though the connection between Cubism and Mathematics is questionable), attended also the “Puteaux Group” meetings. Thus Kupka found himself in an environment strongly influenced by mathematical ideas and his work, that became increasingly abstract after the first decade of the 20th century, may have thus been influenced to some degree by mathematical abstraction. However, this reasonable assumption is not a sufficient explanation for the anachronistic resemblance between the “Fugue” and modern fractal images. Kupka may have attended some lectures in Physics and Biology at the Sorbonne, yet his background was far from scientific: he was actively involved in theosophy and even for some time led séances and made a living as a psychic. It seems that his abstract depictions were led by a strong intuition of the complex forms encountered in nature, as those described by Benoit Mandelbrot. Kupka’s own words refer to the creative ability of an artist that “is manifested only if he succeeds in transforming natural phenomena into ‘another reality’”. And this abstract reality “demands to be formed by invented elements” such as those encountered in his “Amorpha”. Hesiod in his “Theogony” (8th – 7th century B.C.) described the initial condition of the Universe with the rather vague word “chaos”. In “Genesis”, the first book of the Bible, God creates the sky and the earth upon the “abyss”. 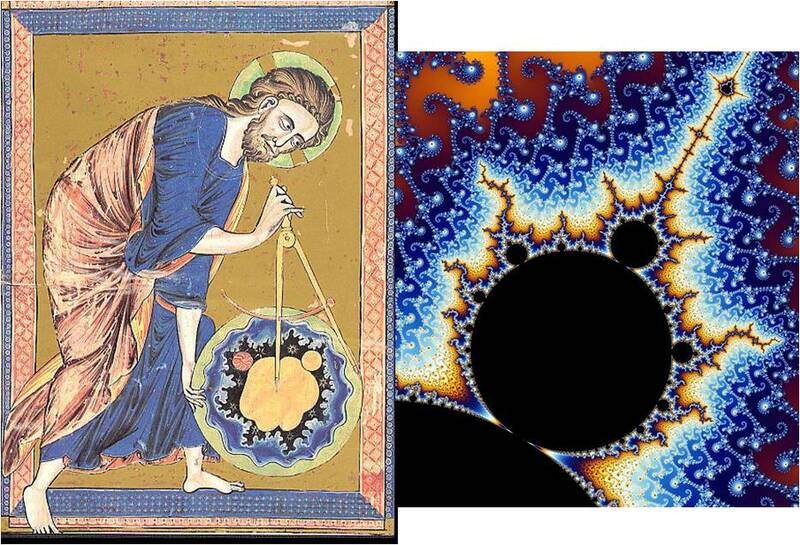 It therefore seems as a visual pun the fact that some entity resembling the emblematic image of the so – called “Mandelbrot set” should appear under a compass operated by God himself. The frontispiece of a Gothic Bible Moralisee, an illustrated Bible (Codex Vindobonensis 2554 at the Austrian National Library, dated ca. 1250 AD) presents a surprising yet meaninful coincidence, not of very different nature than the similarity between Newton’s fractal and Kupka’s “Amorpha”. God is depicted designing the Universe during the first stages of Genesis starting from a seemingly amorphous, chaotic mass. Remarkably, though the word “chaos” has in this case a quite different meaning, the branch of Mathematics and Physics known as “Chaos Theory” is particularly interested in order arising from chaotic systems. Left: Frontispiece of the Bible Moralisee (ca 1250). Right: A detail of the emblematic fractal known as “Mandelbrot set”.